In this Tracer Build Guide, we provide an overview of her strengths, abilities and talents. Tracer is a mobile Assassin and unquesitonably the quickest Hero in Heroes of the Storm. With unrivalled speed and mobility, she can not only kite exceptionally well, but also dart in and out of combat with ease. Unlike other Heroes, Tracer also has several unique mechanics that define her gameplay. Firstly, she can move and shoot similarly to how Tychus utilises Overkill. The key difference being that Tracer can, by default, always move and shoot her basic attacks and is never required to stand still. In addition, she gains her Heroic ability at level 1 and it's at level 10 that she can choose to upgrade it. Finally and unlike any other Hero, she can not only blink forward multiple times to avoid skill shots and incoming damage but she can also reverse time, going back to where she was several seconds before. This combination of abilities makes her slippery, very difficult to deal with and a headache to fight. Reload (Trait) - Allowing Tracer to move and shoot at all times, Reload is key to her playstyle. A single clip allows her to attack 10 times in rapid succession and she will automatically reload once her clip is empty. If you wish to Reload early (which you often should) you simply press your Trait button (D) again. It should also be noted that mounting automatically reloads your weapon also. 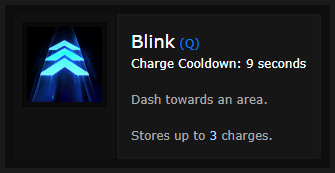 Blink (Q) - Blink is effectively Bolt of the Storm that you can use three times in quick succession. To suggest it's strong would be an understatement. Not only does it allow you to zip around the Battleground incredibly quickly, but it means that you can avoid just about every attack in the process. Being charged by Butcher? Blink away. About to eat a Gravity Lapse? Blink away. Being pulled by Dehaka? Blink away. It's frighteningly good and in the right hands, allows you to stay damage free while still dealing punishment to your enemies. It's important to note that Blink charges return one at a time and you cannot Blink when rooted, stunned or dazed. Try to always save one Blink charge for escaping. Melee (W) - Working in exactly the same was as her Overwatch variant, Melee allows Tracer to quickly pistol whip an enemy. Similarly to Sylvanas' Black Arrows, you also don't need to target any specific Hero as it'll automatically prioritize Heroes over minions. In addition to the high burst damage it provides, it also allows you to gain 5% of your Pulse Bomb charge when you hit a minion or 10% against an enemy Hero. Unsurprisingly, a combination of Blinking towards an enemy Hero followed up by a Melee hit can deal serious instantaneous damage. Recall (E) - Arguably one of the strongest skills in the game and what could be an Ultimate by itself, Recall allows Tracer to travel back in time. Recalling you back by three seconds, reflling your ammo and removing all negative status effects, it's a full "reset" on your Hero. Unsurprisingly Recall also allows you to make some very clever plays such as intentionally overextending to secure a kill only to Recall out of harms way. My particular favorite is baiting a key skill (such as Kael'thas' Gravity Lapse, Recalling before Blinking back to him). Pulse Bomb (R) - By default Pulse Bomb does the following: "Fires a short range Bomb that attaches to enemy units if you hit them. After 1.50 seconds the Bomb explodes, dealing damage to them and half that damage to nearby units. The ability is slowly charged over time by dealing damage to enemies using basic attacks or melee". Unsurprisingly and considering it's an Heroic ability at level 1, it's very strong. It's also incredibly easy to stick on enemy players, especially when you factor in the speed of Tracer and the ease at which she can dart in and out of combat. Simply Blinking up to someone, planting her Pulse Bomb before Recalling backwards is the easiest route (you might as well hit them with Melee while next to them). What I will stress about Pulse Bomb however is that if you don't have Recall available, diving into an enemy can be very risky (even more so if your Blink's are on cooldown as well). Sticky Bomb (R) - The first of three possible upgrades to her Heroic, Stick Bomb increases its detonation radius while slowing enemies by 60% for 3 seconds. Considering Li Ming's Disintegrate 60% slow was recently nerfed, I expect to see this reduced in potency as well. It's incredibly strong and can well and truly screw over an enemy team caught by it. Quantum Spike (R) - Dealing an additional 7% of a targets maximum health, Quantum Spike is all damage. It's a huge amount of extra burst, especially against tanks. Best chosen when against double tank combinations. Pulse Rounds (R) - Significantly increasing the gain at which you charge your Heroic but also increasing its plant range, Pulse Rounds allows you to not only use it more often (you should always be attacking with your Basic Attacks) but significantly improves your poke potential when planting. 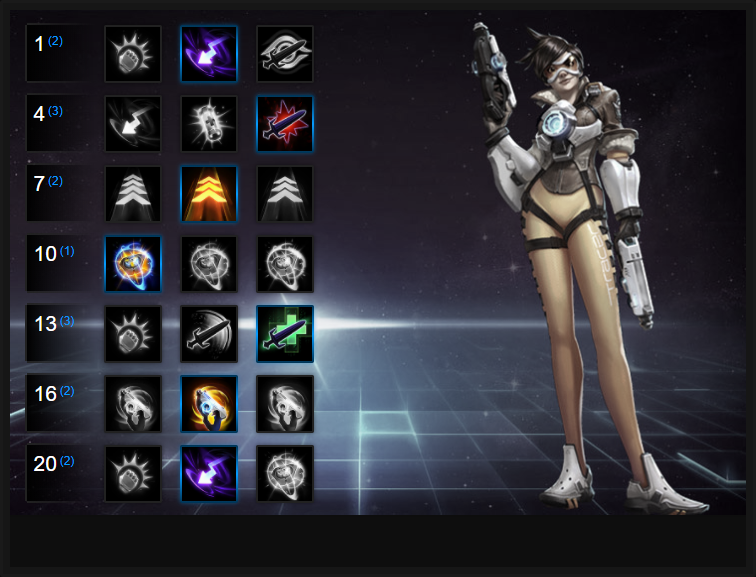 Like our Tracer build guide? You can help support its updates by subscribing to Ten Ton Hammer. Here's the details. Slipstream allows Tracer to regain 1 additional second back when she uses Recall. While it doesn't sound a lot, the additional time will often be enough for her to be a significant distance away from any danger. This not only ensures she can dive more, but also escape with ease. If you're after pure damage, take Untouchable. It is possible to survive with Tracer but you have to play smart and the 30% damage increase provided is significant. As long as you remain alive and have a team to fall back on, maintaining the buff is fairly easy as long as you also keep one Blink charge spare at all times. Bullet Time reduces the cooldown of Tracer's Blink by 0.15 seconds every time she uses a basic attack. If you consider how often she fires, and how many shots are in each pistol, this significantly reduces your Blink cooldown. Sticky Bomb slows anyone hit by Tracer's Pulse Bomb by 70%, while also increasing its radius by 50%. For allowing her to follow up with repeat damage, it's amazing. If you're after some sustain, take Leeching Rounds. Based on your damage and attack speed, 20% healing is fairly significant and allows you to keep topped up (especially when you factor in your tiny health pool). Variable: Ricochet provides traer with a 50% chance to hit enemies near your primary target. It works against minions and in a group fight and based on the speed Tracer fires. Focus Fire provides a charged bullet if Tracer empties a full round into a single enemy. When pursuing one target, or to finish someone off with a slither of health, the extra burst helps significantly and allows her to cut down targets quick quicker. Providing Tracer with a heal once she uses Recall, Total Recall is incredible. It's effectively a second life, depending on how much damage you took before using the skill. In 1 on 1 situations, all you need to do is use Recall before you die and you're back to full life ready to finish off the enemy you're fighting. It's also invaluable against Zeratul and Nova who will burst you to near death. Hitting Recall will recharge all your health and then allow you to hunt them down. These Hero Threat Levels (1 being lowest threat and 10 being highest threat) are to help you determine which enemy Heroes can give you a headache. For the Heroes listed here, take extra care as they're particularly dangerous for Tracer. Brightwing: Polymorph + Vulnerability makes for a very dead Tracer. Jaina: Her ability to slow you and deal enormous damage can kill you near instantly. If your Blink and Recall are on cooldown, she'll cause you serious trouble but only if you don't have them available. Lunara: Her Heroic isn't too much of a worry, but it's her poison that can very quickly wreck you. If she also takes the slow on her level 16 talent, at the very least you'll have to Recall to cleanse it. Raynor: His basic attacks can kill you in three hits and his self healing means that he can withstand your poke. If he times his knockback to prevent you Blinking, you're dead. Sylvanas: If she uses Mind Control on you, you're gaurenteed to die (especially if she has taken the improved talent at 20). Any good Sylvanas will use it on you as often as possible. This list of tips and tricks are just a handful of things we think will help your Tracer play. We'll continue to add to the list as required and if you have any tips you'd like to share, let us know in the comments below and we'll place them here. 1. Ensure that you save your Recall before a team fight or objective. It's key to resetting your Blink's and ensuring your survivability. 2. Try to always keep at least one Blink charge ready. You may need it to escape or hunt enemy players down. 3. Three Blink charges and a Recall affords Tracer unparalleled mobilty for engaging and escaping. It allows Tracer to really push her luck, similarly to how Illidan can. It takes practice to really nail how far you can stretch her abilities in a fight. 4. Try to focus squishy targets as often as possible, using your mobility to harrass and generally be a nuisance. Heroes such as Li Ming, Jaina or Lt. Morales are incredibly easy to focus on. 5. Your highest burst damage is: Blink > Pulse Bomb > Melee > Blink backwards > Basic Attack. 6. Mounting up, returning to Core or using Recall will reload your ammo. 7. Always ensure you have a full clip, at all times. If there's a window of opportunity to reload before you get in reach of an enemy, you should do so. 8. Try to always place your Pulse Bomb on high value targets (especially healers) as this will pressure them very early in a fight. 9. Be very wary of DOT based skills. Your Recall can remove them but you're then vulnerable for 20 seconds and if you are hit by several, regardless of your Blink skill, you'll die very quickly. 10. Tracer has the lowest health in the game and can die in just a couple of critical hits from the likes of Valla or Raynor. Stun attacks are your nemesis - be wary against Heroes who can incapacitate you. 11. Due to your speed, it's actually really difficult for healers to keep track of you - especially Lt. Morales or Kharazim. Remember this when you're darting in and out of fights. Malfurion works particularly well with Tracer as he can apply a heal on you and then let you loose. Thanks for reading our Tracer build guide. You can help support its updates by subscribing to Ten Ton Hammer. Here's the details.